Carmen Aristegui, a leading Mexican investigative journalist, says her country is becoming increasingly authoritarian under President Nieto. She was fired by MVS Radio shortly after reporting on a luxury house built for the first lady. Aristegui, who is a prominent left-wing figure in Mexico with over 3 million subscribers following her Twitter account, was fired by her long-time employer MVS Radio two weeks ago. Two journalists working as part of Aristegui’s 17-strong investigative team launched a website called Mexicoleaks, which is meant to ensure anonymity to whistleblowers. MVS Radio accused them of illegally using the company’s brand name for the site and fired them. In the ensuing conflict the anchorwoman herself had to leave the station. In an exclusive interview with RT, Aristegui said the Mexicoleaks story was a pretext for, rather than the cause of the dismissals. She believes the Mexican government’s irritation with independent investigative journalism is behind the fallout with MVS Radio, Aristegui told RT. “It all indicates that there was some kind of threat or collusion or something to deal with an angered government that in a sense was cornered by the investigations of the group. We certainly take it as a serious measure coming from the highest level of the government,” she said. 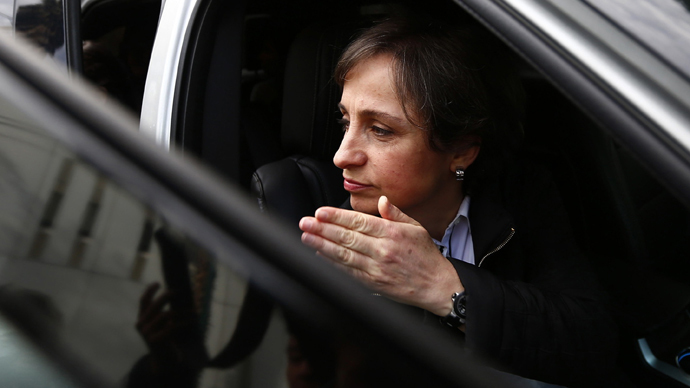 Aristegui was sacked shortly after reporting on her website that Mexico’s first lady Angélica Rivera had a luxurious house built for her in Mexico City’s most exclusive neighborhood. The company that built it had won hundreds of millions of dollars in contracts with the government of President Enrique Peña Nieto. Aristegui’s parting with MVS Radio was the second in her career. Back in 2011, the station fired her for alleging that then-President Felipe Calderón might have drinking problems. She was reinstated days later after widespread public outcry. The dismissal, CNN reported later, was done under pressure from Calderón's office, which demanded a public apology from Aristegui and said it wouldn’t resolve an issue relating to MVS Radio’s broadcasting frequencies unless she issued one. No such apology was aired.